This lands on the realm of interesting. 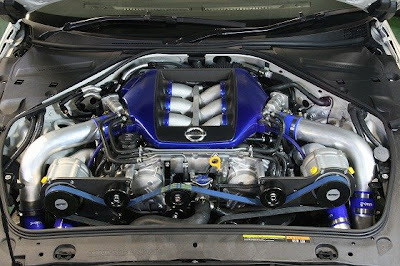 A quad charged GT-R. Twin Rotrex superchargers and stock twin turbos on this Power Enterprise demo GT-R. The full specifications of the kit are going to be released at the TAS. I imagine this will be a fairly expensive kit. Its also interesting as belted superchargers act similar to turbochargers in their power delivery. They run about $2200 each, and are capable of supplying about 400 hp each supercharger. They would honestly be a little on the large side when used in conjunction with the factory turbochargers. Source : Power Enterprise via GTRCenter. Holy LORD!!!! thats like the most powerful GTR R35 to date!!! What about the transmission system?? 400HP per S/C thats 800HP + the stock Turbochargers AAH! OMG. That’s really interesting but really what about the trany? PPG Gearboxes is working on a transmission upgrade, as are several other companies.